This paper provides a basis for conservation work by detailing the micromammalian taxa occurring in the Northern Cape Province. It presents new evidence from 30 barn owl pellet collections, augmented by previously published material from trapping or observation (here called 'conventional' reports) and owl roosts, divided into pre-1930, 1930-1979 and 1980 and newer as an indication of continuity of occurrence. A historical perspective is added by the inclusion of material from two archaeological sites dating to the Pleistocene (before about 10 000 years ago) and || from the Holocene (after about 10 000 years ago). 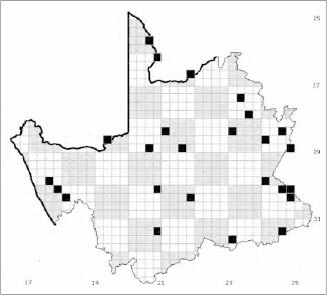 Northern Cape Province synonymies are provided as an aid to equating older records with modern taxonomy. 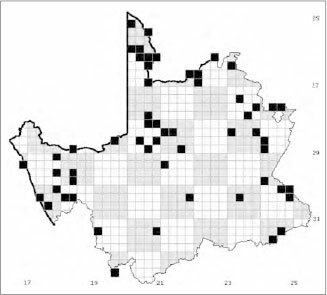 In all, 77 currently recognized micromammalian species have been recorded from the province. These comprise five Afrosoricida (golden moles), six Macroscelidea (elephant shrews), eight Soricomorpha (forest shrews), 16 Chiroptera (bats), and 42 Rodentia (rodents). 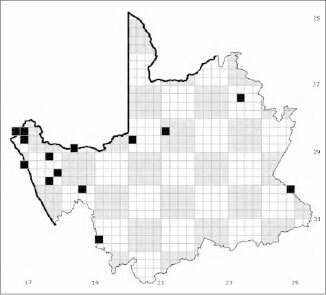 Keywords: micromammals, distribution, Northern Cape Province, modern, Holocene, Pleistocene. 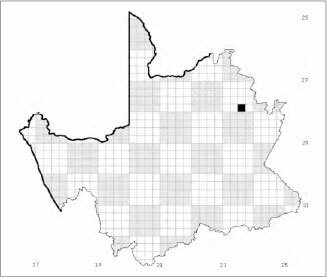 The Northern Cape Province in its present configuration (Fig. 1) has been in place since 1994 when the current provinces were delineated. Before that, the region formed part of the Cape Province, which, additionally, comprised part of what is now North West Province in its northeast corner, the Western Cape Province and Eastern Cape Province. This, in itself, need not have caused problems in determining whether material was actually collected in the modern Northern Cape Province. When, however, these changes are compounded by lack of precision or name changes in collecting localities, there may well be some doubt. Some of the problems include the fact that the informal term 'northern Cape' was previously used to indicate that part of the previous Cape Province now largely, but not entirely, coincident with the current Northern Cape Province. Namaqualand is divided by the Orange River into Little Namaqualand (the western part of the Northern Cape Province, which was described by Shortridge (1942) as lying between the Orange River and 31°S, and from the west coast to 19°E) and Great Namaqualand, which is in Namibia. When the term Namaqualand is used it is not always certain which side of the Orange River is intended. Further east, what was once known as the Bechuanaland Protectorate is present-day Botswana whereas British Bechuanaland became part of South Africa in 1895 (Skead 1973). The latter comprises the area south of the Molopo River between Kuruman in the Northern Cape Province and Vryburg in the North West Province. 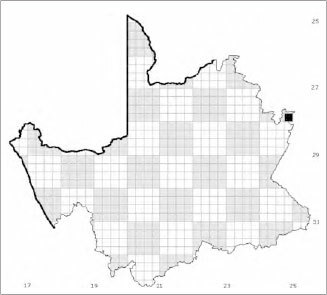 Thus, reference to Bechuanaland may mean modern-day Botswana or either of two South African provinces. 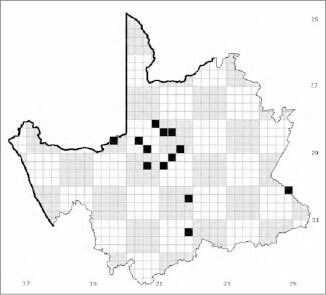 Study of the micromammals in the Northern Cape Province of South Africa has been periodic after a surprisingly early start, given the remoteness of the region. Possibly the first records are those by Gordon in 1779 of animals he called 'blesmollen' (Georychus capensis) from Ellenboogfontein (as discussed by Rookmaker 1989, pp. 115, 304, 307) and of the short-eared elephant shrew Macroscelides proboscideus from Voorsigtigskloof. A further 50 years elapsed before Smith described (1836) and illustrated (1849) material he collected from the Northern Cape. 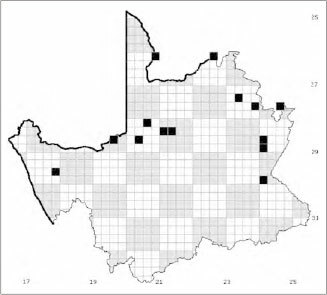 Around the same time, according to Skead (2011), Alexander (1838) and Backhouse (1844) encountered mole-rats in Namaqualand, and Backhouse also saw a probable Myotomys unisulcatus in the Herbert District (Skead 2011). A further 70 years after that C.D. Rudd undertook a collecting trip in Little Namaqualand (Thomas & Schwann 1904), and R.B. Woosman and R.E. Dent collected in the Kuruman area (Schwann 1906). Between the early 1920s (Shortridge 1942; Shortridge & Carter 1938; Thomas & Hinton 1923) and the early 1950s (Lundholm 1955) further periodic collection was undertaken in the western part of the province but it was not until the 1970s that concerted attention was paid to the north-central region that is encompassed in the Kgalagadi Transfrontier Park (previously the Kalahari Gemsbok National Park) (De Graaff 1974; Nel & Rautenbach 1975; Nel et al. 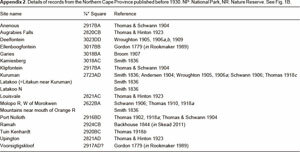 1984; Rautenbach & Nel 1975; Rautenbach 1971) as well as the Augrabies Falls National Park (De Graaff 1974; Rautenbach et al. 1979). 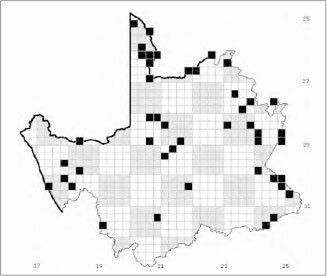 Although earlier work was based on conventional collecting, most recent information on the distribution of micromammals in the Northern Cape Province has come from the remains of animals eaten by barn owls. 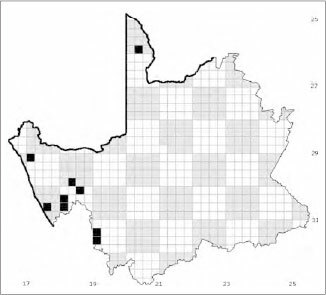 Davis (1959) was the pioneer of this line of investigation in South Africa and, indeed, he (Davis 1958) and Nel & Nolte (1965) listed the micromammals of the then Kalahari Gemsbok National Park based on this source of evidence even before the detailed fieldwork discussed above was undertaken. Following the report by Vernon (1972) for southern Africa as a whole, Dean (1975) and MacDonald & Dean (1984) restricted their attention to the Northern Cape Province. Again, the central part of the province remained effectively unexplored although, in this case, one reason is quite clear; finding barn owl roosts in this arid region is not easy. Barn owls, primarily, with or without other predators, must also have been responsible for accumulating micromammalian remains in archaeological sites (see e.g. Andrews 1990) so the contribution of owls to our knowledge of micromammalian distributions also has a historical perspective. 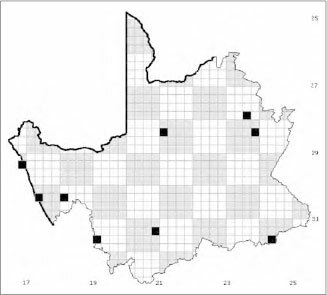 So far, not many archaeological sites have been found in the Northern Cape Province, for which there are various possible reasons. One may be the paucity of suitable caves and rockshelters. Another could be the aridity of the region but it must be borne in mind that climatic conditions changed during the past (see e.g. Tyson 1999) and it has long been known (Bowen 1933) that, even today, climate variation on a seasonal annual or decadal scale can influence the presence of predators such as barn owls in a marginal area. The existence of suitable roost sites for the avian raptor and conditions favourable to preservation of prey remains must also be considered. Finally, there is always the possibility that more sites remain to be found. 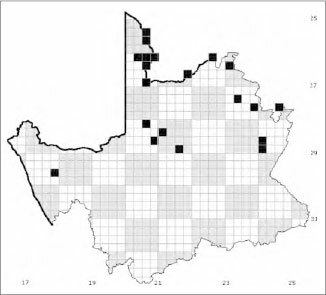 The most important site with a long record of micromammals in the region is Wonderwerk Cave, which lies some 45 km south of Kuruman. Wonderwerk was first described by Malan & Cooke (1941), and from the 1970s onwards has received recurring attention (Beaumont, 1979; Thackeray 1984; Rüther et al. 2009). 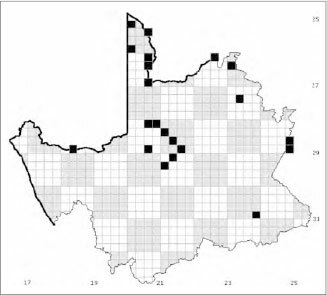 The prolific micromammal remains from this site have provided a history of the occurrence of many taxa during the Holocene (approximately the last 10 000 years) (Avery 1981) and during parts of the Pleistocene (approximately ~0.78-1.96 Ma) (Avery 1995; Chazan et al. 2008). 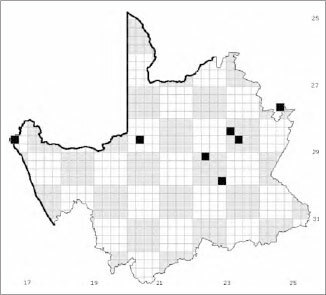 The present paper brings together information from primary publications on micromammals of the Northern Cape Province, partly as a historical record and partly as a service to conservation in the province. Although a few collations have been undertaken in the past (Stuart et al. 1978; Herselman & Norton 1985), these have either not been inclusive or are geographically non-specific, and are, in any case, in need of updating. In particular, new data resulting from the dedicated collection of owl pellet samples have provided significant new distributional information on various taxa. 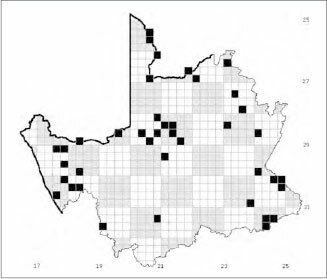 This illustrates the usefulness ofsuch work for determining the species diversity of particular areas and its potential for providing a monitoring service for future conservation work in the province. That such material should be permanently lodged in a museum collection, for future study or verification, is crucial. 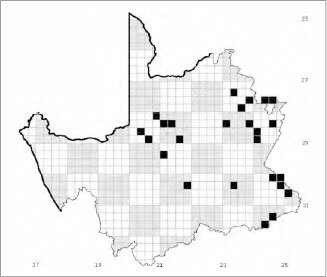 The unpublished collections of barn owl pellets and bulk pellet residues discussed here were collected from sites throughout the Northern Cape Province and are lodged in Iziko South African Museum, Cape Town (Appendix 1, Fig. 1A). Individual pellets were measured and weighed, then prepared in a solution of sodium hydroxide to dissolve hair. Mandibles and maxillae were extracted from pellets and the bulk samples ofdecomposed pellets, and were identified, with and without teeth, by D.M.A. Further discussion of identification methods is given in Avery et al. (2002) and Avery (2007). Material from each site is accessioned with a unique accession number and identified informally by a unique three-letter code, as given in Appendix 1. Multiple collections from one site are identified by collection number and by date. Individual pellets are allocated a unique number and the contents are stored in individual labelled plastic bags; bulk residues are identified by site and collection number, with different taxa in separate labelled plastic bags. Databases detailing the identified material from each pellet or bulk sample are available from the authors. To give an indication of the known history of each taxon in the Northern Cape Province various supplementary sources were consulted. 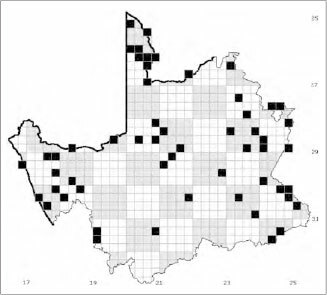 These include published primary conventional and owl-pellet records grouped according to whether they appeared before 1930, between 1930 and 1979, or from 1980 onwards. Only the original record is given where it is clear that earlier records are repeated in later publications. 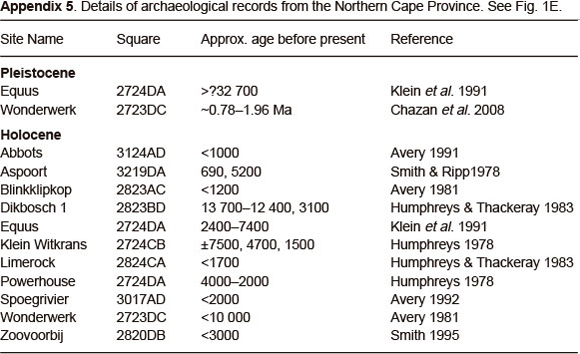 Records from archaeological sites are listed as either Pleistocene or Holocene. Appendices 2-5 give details of the collection sites and publications in each category. Museum databases have not been consulted directly but major Northern Cape holdings are housed in the Ditsong National Museum of Natural History (originally the Transvaal Museum, part of the former Northern Flagship Institution), the Amatola (previously Kaffrarian) Museum in King Williams Town and the Natural History Museum in London. Archaeological samples are currently housed in the Iziko South African Museum in Cape Town. Figures 1B to 1E show the quarter-degree squares from which material in each time category has been recovered. 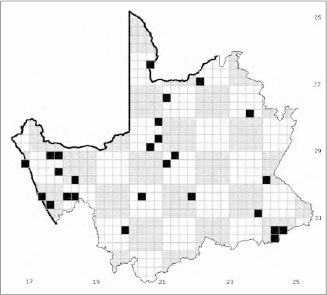 Because this survey refers solely to material from the current Northern Cape Province, only type localities situated in this province are given. Similarly, only those synonyms based on specimens from the province are listed. The taxonomic arrangement follows Wilson & Reeder (2005), with subsequent amendments where necessary. 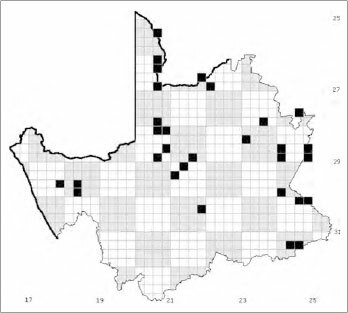 Comments: the type locality for C. shortridgei Broom, 1950 is Sutherland but, although Bronner & Jenkins (2005) list shortridgei as a synonym of C. sclateri, they do not mention the Northern Cape Province as within the range of this species. Synonyms: C. namaquensis Broom, 1907; C. tenuis Broom, 1907; C. concolor Shortridge & Carter, 1938; C. asiatica namaquensis Broom, 1946; C. dixoni Broom, 1946; C. elegans Broom, 1946; C. shortridgei Broom, 1946. 1930-1979: Craiglockhart, Eselfontein, Garies, Kameelboom, Kamiesberg, Nieuwoudtville, 24 km inland of Port Nolloth, Witwater. New records: Kaitob Berg, Lokenburg Farm. Previous records • Type locality: Gouna. 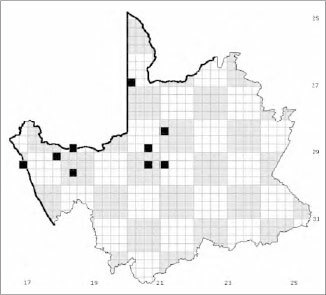 Comments: the type locality remains the only place from which this species has been recorded. Comments: this taxon has not been found in owl pellet samples in the province. 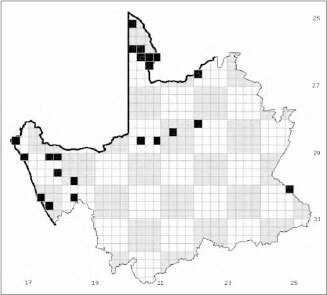 This is probably because collecting has not been conducted within its range because it has been found in barn owl pellets to the north in Namibia and to the south in the West Coast National Park (Avery et al. 1990). Its presence at Spoegrivier indicates that it has some antiquity in the region. Synonyms: E. karoensis Roberts, 1938 was assigned to E. edwardsii by Schlitter (2005) but has recently been transferred to E. rupestris by Smit et al. (2008). 1930-1979: Eselfontein, Kameelboom, Okiep, Paddagat, Vanwyksvlei, Witwater. Comments: in view of the site location, the material from Vanwyksvlei is probably referable to E. pilicaudus (see below). 1930-1979: Auchterlonie, Ky Ky, Nossob Camp, Twee Rivieren Camp. 1980 + : Carnarvon Commonage, Goraas Farm, Slytfontein Farm. Comments: this species has onlyrecentlybeendistinguished from E. edwardii (Smit et al. 2008). Although some external features have been found to separate the two species, osteological and dental characters are unfortunately not among them (Smit et al. 2008). For the present therefore it is not possible to determine to which of the two species the specimens from Lokenburg belong. Synonyms: E. barlowi gordoniensis Roberts, 1946; Elephantulus karoensis Roberts, 1938. Type locality: 'mts nr mouth Orange R'. 1930-1979: Augrabies Falls National Park, Augrabies Falls W, Deelfontein, Eenriet, Hester Malan Nature Reserve, Louisvale, Platbakkies, Rolfontein Nature Reserve, Rooidam, Stolzenfels, Upington, Upington E, Witwater published pellets: Springbok, Upington. Comments: E. karoensis has recently been found to cluster with E. rupestris (Smit et al. 2008) and has therefore been removed from E. edwardii, where it had been placed by Schlitter (2005). Synonyms: M. p. chiversi Roberts, 1933; M. p. brandvleiensis Roberts, 1938; M. p. calviniensis Roberts, 1938 ; M. p. harei Roberts, 1938; M. p. isabellinus Shortridge & Carter, 1938. Pre-1930: Deelfontein, Klipfontein, Port Nolloth, Voorsigtigskloof. 1930-1979: Brandvlei, Brospan, Calvinia E, Eenriet, Hester Malan Nature Reserve, Kameelboom, Platbakkies, Samevloeiing, Upington N, Witwater. New records: Driekoppen, Gelukspruit, Holpan, Kaitob Berg, Kenhardt Railway Bridge, Kleinbegin-Kenhardt road, Swartpad, Vanzylsrus, Vergelegen 132. Comments: Van der Stel is said to have seen this species at Goede Hoep in 1685 but this place is now in the Western Cape Province and, in any case, the identification is based on the distribution of the species (Rookmaker 1989, p. 22). Synonym: Sorex concolor A. Smith, 1836. 1930-1979: Augrabies Falls National Park, Bushmanputs, Eselfontein, Platbakkies, Rolfontein Nature Reserve, Springbok, Upington, Upington SE, Witwater. 1980+: Grootfontein, Heuningsvlei, Marrick, Swartmodder. Holocene: Blinkklipkop, Dikbosch 1, Klein Witkrans, Spoegrivier, Wonderwerk, Zoovoorbij. Holocene: Abbots, Dikbosch 1, Klein Witkrans, Limerock, Spoegrivier, Wonderwerk. Comments: the distribution of C. flavescens in the Northern Cape Province is shown as extending as far as Port Nolloth along the west coast (Skinner & Chimimba 2005). The record from Springbok (Vernon 1972) needs confirmation because inthe 1990s onlyC. cyaneawas found in the nearby Skilpad Wildflower Reserve. All the eastern samples are from archaeological sites, which indicate a wider distribution at various times during the past. 1980+: Grootfontein, Heuningsvlei, Marrick, Moffat Mission, Swartmodder, Vaalharts. New records: Benfontein Game Reserve, Driekoppen, Doornkuilen, Doornkloof Nature Reserve, Kenhardt Railway Bridge, Laaikrale, Ongers River Bridge. 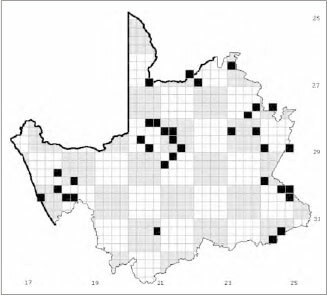 Comments: Crocidura fuscomurina is clearly widely distributed in the eastern half of the province but without owl pellet records this fact would not have been known. Synonym: C. deserti Schwann, 1906. Pre-1930: Molopo R. W of Morokwen. Hester Malan Nature Reserve, Kamfersboom, Kingston Farm, Kransbrak, Ky Ky, Monro, Nossob Camp, Samevloeiing, Twee Rivieren. 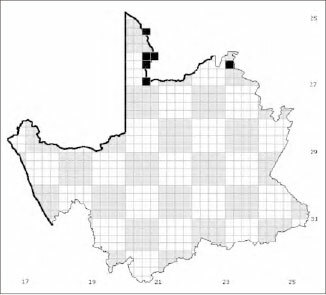 New records: Deekrand, Kleinbegin Station, Kransbrak, Lovers Leap, Spitzkop Nature Reserve, Twee Rivieren C.
Comments: the record from the Hester Malan Nature Reserve constitutes a considerable extension to the range given by Skinner & Chimimba (2005). Comments: so far this shrew has not been found in modern samples from the province so conditions may no longer be favourable for it. Comments: the occurrence within the last few hundred years of S. lixus very far from its current area of distribution may be explained in terms of different climatic conditions from those of the present day. 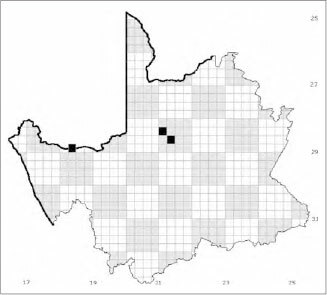 This suggestion is supported by other micromammalian evidence from Abbots Cave, which reflects climate and vegetational change during the Little Ice Age of the 19th Century in the interior of South Africa (Avery 1991). 1930-1979: Kingston Farm, Marrick, Springbok. Holocene: Blinkklipkop, Dikbosch 1, Spoegrivier, Wonderwerk. New records: Benfontein Game Reserve, Doornkuilen, Dronfield Game Reserve, Doornkloof Nature Reserve, Holpan, Kransbrak, Lokenburg Farm, Vergelegen 132. 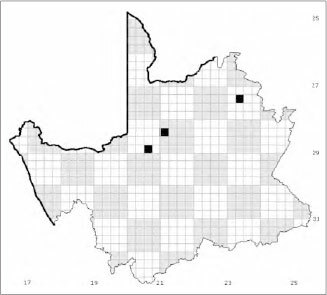 Comments: the only records ofthis species in the Northern Cape Province are from modern owl pellets and archaeological sites. 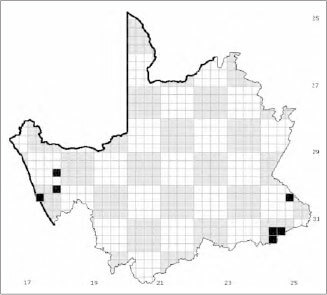 The current western samples, and especially that from the Kalahari Gemsbok National Park, represent range extensions from the Free State Province. Holocene: Dikbosch 1, Spoegrivier, Wonderwerk. 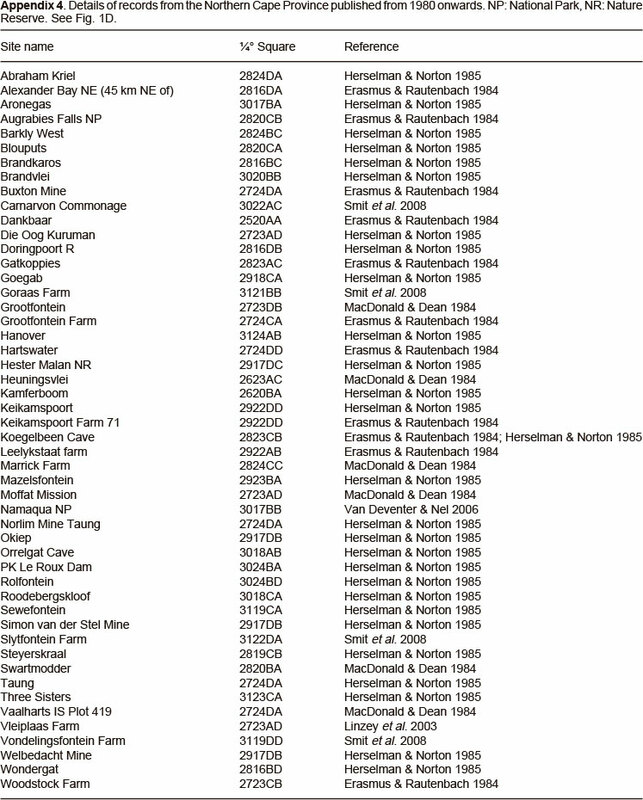 New records: De Cruis, Lokenburg Farm, Spitzkop Nature Reserve, Vergelegen 132. 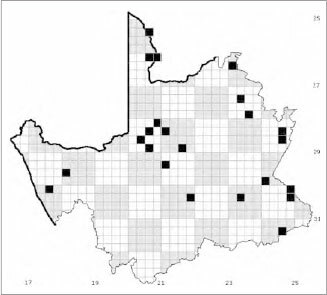 Comments: the records north of 29°S show that this species is, and was, more widely distributed in the province than is shown by Skinner & Chimimba (2005). 1930-1979: Augrabies Falls National Park, Goodhouse, Leliefontein, Orrelgat, Paddagat. Comments: the archaeological material from the eastern part of the province requires re-examination before it can be accepted that this species was previously more widespread than it is currently. On present evidence it seems more likely that R. denti is the species represented (see below). Synonym: R. augur K. Andersen, 1904. 1980+: Die Oog Kuruman, Koegelbeen Cave, Roodebergskloof, Simon van der Stel Mine. 1980+: Alexander Bay NE, Augrabies Falls National Park, Buxton Mine, Gatkoppies, Keikamspoort Farm 71, Koegelbeen Cave, Leelykstaat Farm. Comments: Monadjem etal. 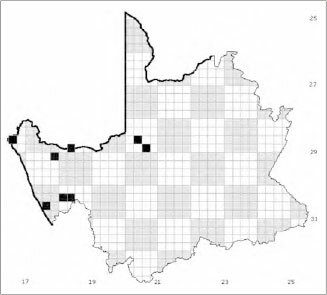 (2010, p. 208) note that because the specimens from Klipfontein cannot be located this record should be treated as unsubstantiated, especially in view of the fact that the nearest confirmed localities are some 750 km to the north in Namibia. Comments: the Brandkaros occurrence listed by Herselman & Norton (1985) constitutes a slight extension to the range shown by Monadjem et al. (2010). However, that from Leelykstaat is far from other recorded occurrences, a fact that caused Erasmus & Rautenbach (1984) to speculate that this species has a much wider subcontinental range than was then accepted. The fact that the specimens were caught close to the Orange River may also have a bearing on distribution. 1930-1979: Garies, Goodhouse, Hester Malan Nature Reserve, Louisvale, Port Nolloth, Rolfontein Nature Reserve. • 1980+: Blouputs, Brandkaros, Doringpoort R, Hester Malan Nature Reserve, Okiep, Sewefontein, Welbedacht Mine, Wondergat. 1930-1979: Augrabies Falls National Park, Goodhouse, Stolzenfels. 1930-1979: Auchterlonie, Kransbrak, Louisvale, Nossob Camp, Rolfontein Nature Reserve. 1980+: Abraham Kriel, Aronegas, Augrabies Falls, BarklyWest, Goegab, Heuningsvlei, RolfonteinNature Reserve. New records: Doornkloof Nature Reserve, Driekoppen, Gelukspruit, Holpan, Kransbrak, Kenhardt RailwayBridge, Kleinbegin Station, Kleinbegin-Kenhardt road, Laaikrale, Ongers River Bridge, Swartpad. Synonym: E. megaluruspallidior Shortridge, 1942. Comments: Monadjem et al. 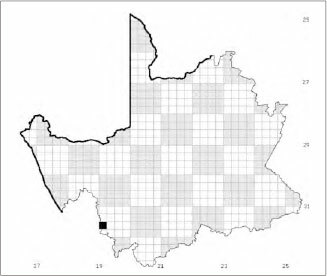 (2010) list a specimen from Kuruman and it is clear from their map that this species potentially occurs over much of the Northern Cape Province although its distribution appears patchy due to a requirement for rocky crevices and caves in which to roost (Monadjem et al. 2010). New records: Doornkloof Nature Reserve. Comments: these records constitute a major extension to the actual and potential range of this species and provide additional evidence of greater habitat tolerance than was once suspected (Monadjem et al. 2010). 1930-1979: Augrabies Falls National Park. 1930-1979: Eselfontein, Kaspersdraai, Louisvale, Rolfontein Nature Reserve. 1980+: Barkly West, Brandvlei, Die Oog Kuruman, Hester Malan Nature Reserve, Moffat Mission, PK le Roux Dam, Rolfontein Nature Reserve, Steyerskraal, Three Sisters. New records: Benfontein Game Reserve, De Cruis, Doornkloof Nature Reserve, Driekoppen, Holpan, Kransbrak, Kleinbegin Station, Laaikrale, Lovers Leap, Skilpad Wildflower Reserve, Swartpad. Comments: this taxon is now considered to include N. melckorum (Roberts, 1919), which was recognized by Simmons (2005) as a separate species, although with some doubt as to whether the southern African material is distinguishable from N. capensis (Monadjem et al. 2010). 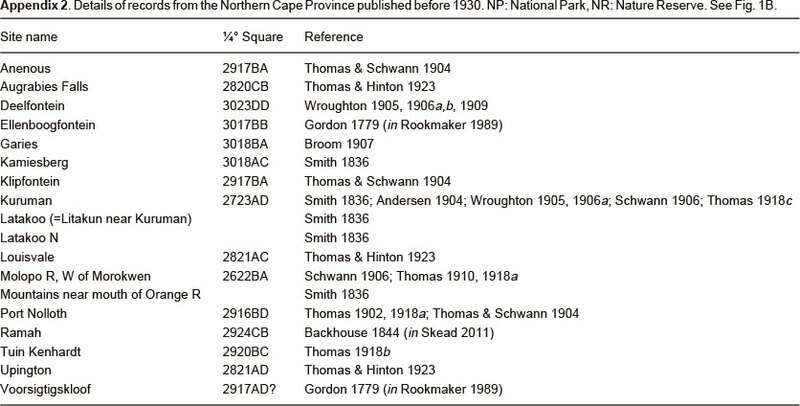 Accordingly, material from the Hester Malan Nature Reserve and Three Sisters, which Herselman & Norton (1985) assigned to N. melckorum, have here has been included in N. capensis. 1980+: Goegab, Goodhouse, Mazelsfontein, Steyerskraal. Comments: according to Monadjem et al. 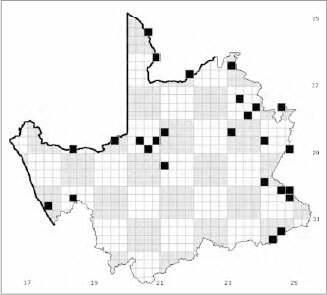 (2010), although the taxonomic relationship between C. seabrae and C. lesueuri Roberts, 1919 has not been fully resolved, the former species is restricted to the arid western parts of southern Africa whereas the latter appears to be associated with high altitude montane grasslands. For this reason it seems most likely that the material from Mazelsfontein, which Herselman & Norton (1985) assigned to C. lesueuri, belongs with C. seabrae. Both Mazelsfontein and Driekoppen fall near the eastern extent of the potential range as shown by Monadjem et al. (2010). 1980+: Die Oog Kuruman, Goegab, Koegelbeen Cave, Moffat Mission, Norlim Mine Taung, Orrelgat, Roodebergskloof. 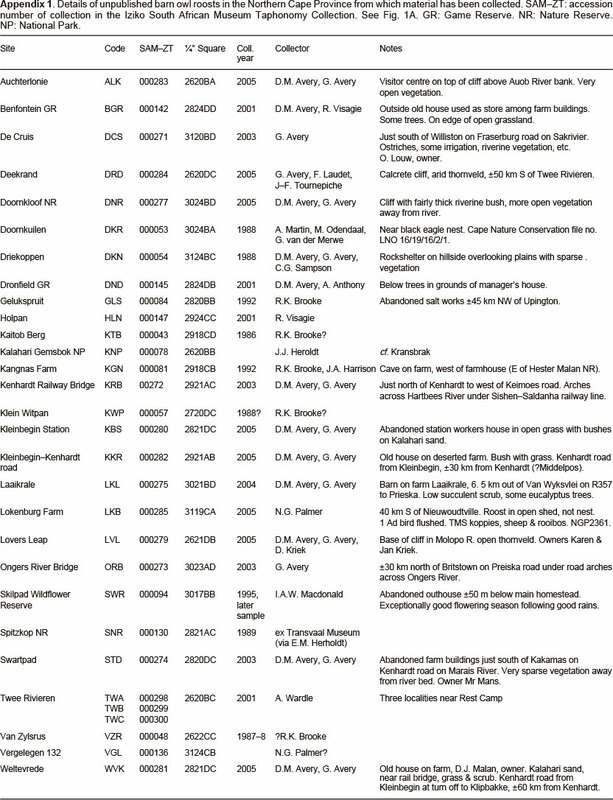 New records: Kenhardt Railway Bridge. Comments: M. natalensis was previously considered to be a subspecies of M. schreibersii (Simmons 2005), and all published material was assigned to the latter species. More recently, however, M. natalensis has been shown to be a separate species (Miller-Butterworth et al. 2005) and is accepted as such by Monadjem et al. (2010). Although M. natalensis is actually or potentially distributed over much of southern Africa there is a gap in the more arid interior of South Africa. It is therefore of some interest to note that the Kenhardt Railway Bridge material and the archaeological sample from Zoovoorbij fall within this gap. It may be that these sites are on migration routes between summer maternity roosts and winter hibernacula (Monadjem etal. 2011) so it would be worth collecting more pellets from Kenhardt at different times of the year. Synonym: G. griselda Schwann, 1906. Comments: the archaeological specimens and material from Rolfontein Nature Reserve (Jooste 1977; Stuart et al. 1978) were originally assigned to G. murinus at a time when the two species were not recognized as distinct, and the Kuruman material was assigned to G. griselda. The latter is now recognized as a synonym of G. microtis by Holden (2005), who considers populations of G. murinus to be restricted to forest habitats. 1930-1979: Eselfontein, Rolfontein Nature Reserve, Witwater. Synonym: Gliriscus rupicola australis Shortridge & Carter, 1938. Comment: for about 25 years this species was considered to be a subspecies of G. playtops (Ellerman et al. 1953; Genest-Villard 1978) but Holden (2005) has reverted to the original view of Thomas & Hinton (1925) that it represents a separate species. Synonym: S. hildae Schwann, 1906. 1930-1979: Augrabies Falls National Park, Goodhouse, Kameelboom, Kingston Farm, Louisvale, Nossob Camp, Platbakkies, Rolfontein Nature Reserve, Stolzenfels. Holocene: Blinkklipkop, Limerock, Powerhouse, Wonderwerk. New records: Benfontein Game Reserve, DoornkloofNature Reserve, Doornkuilen, Driekoppen, Holpan, Kenhardt Railway Bridge, Kransbrak, Lovers Leap, Swartpad, Vergelegen 132. Synonym: Poemys melanotis insignis Shortridge & Carter, 1938. 1930-1979: Auchterlonie, Eselfontein, Nossob Camp, Twee Rivieren Camp. 1980+: Grootfontein, Heuningsvlei, Marrick, Moffat Mission, Swartmodder, Woodstock Farm. Holocene: Blinkklipkop, Spoegrivier, Wonderwerk, Zoovoorbij. New records: Driekoppen, Dronfield Game Reserve, Holpan, Kransbrak, Lovers Leap, Vanzylsrus, Vergelegen 132. 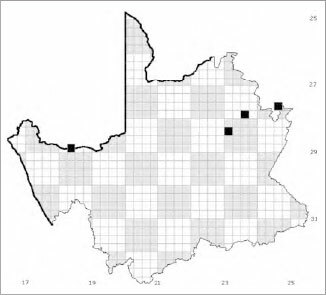 Comments: the records from south of about 29°S and east of about 20°E represent an extension of the range of this species shown by Skinner and Chimimba (2005), indicating that the gap in distribution is not as large as it appears. A record ofD. mystacalis from the Kalahari Gemsbok National Park (De Graaff 1974) lies well outside the known range of the species (Skinner & Chimimba 2005) and is very likely a mistake. For this reason, the presence of this species in the Northern Cape Province is discounted until confirmation is forthcoming. 1930-1979: Ky Ky, Kingston Farm, Kwang Pan, Marrick, Nossob Camp, Samevloeiing, Springbok. 1980+: Rolfontein Nature Reserve, Marrick, Swartmodder. Holocene: Abbots, Blinkklipkop, Limerock, Powerhouse, Wonderwerk, Zoovoorbij. New records: Benfontein Game Reserve, Deekrand, Doornkuilen, Driekoppen, Dronfield Game Reserve, Gelukspruit, Holpan, Kaitob Berg, Kangnas Farm, Kenhardt Railway Bridge, Klein Witpan, Kleinbegin Station, Kleinbegin-Kenhardt road, Laaikrale, Lovers Leap, Swartpad, Vanzylsrus, Weltevrede. 1980+: GrootfonteinFarm, Grootfontein, Heuningsvlei, Moffat Mission, Woodstock Farm. New records: Doornkloof Nature Reserve, Kaitob Berg, Lokenburg Farm, Lovers Leap. 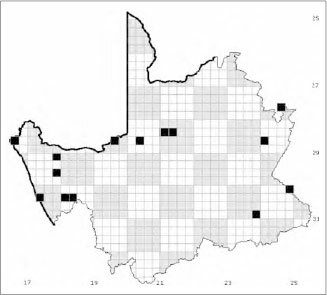 Comments: the published pellet specimens were originally assigned to S. pratensis (Macdonald & Dean 1984), this being the only species recognized in South Africa at the time. Now, however, it is most likely that this material should be assigned to S. krebsii since S. pratensis, as understood today, is confined to the northwest of South Africa (Skinner & Chimimba 2005). Holocene: Abbots, Aspoort, Blinkklipkop, Dikbosch 1, Equus, Klein Witkrans, Limerock, Powerhouse, Spoegrivier, Wonderwerk. New records: Doornkloof Nature Reserve, Driekoppen, Vergelegen 132. 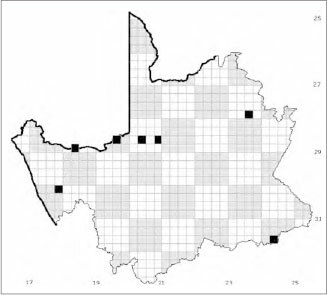 Comments: the main, eastern, area of distribution of this species has been shown as extending to about 25°E (Skinner & Chimimba 2005) so that most, if not all, the current records comprise a westwards extension to the existing record. 1930-1979: Eenriet, Eselfontein, Platbakkies. Comments: there are no recent records of this species. Synonym: P. collinus capensis Shortridge & Carter, 1938. New records: Skilpad Wildflower Reserve, Vergelegen 132. Comments: the archaeological record from Wonderwerk suggests this taxon may once have been more widely distributed than it is today. Comments: this is a new, albeit marginal, record for the Northern Cape Province. pre-1930: Anenous, Augrabies Falls, Kuruman, Molopo. 1930-1979: Auchterlonie, Augrabies Falls, Augrabies Falls W, Batulama, Bushmanputs, Colesburg, Craiglockhart, Eenriet, Goodhouse, Hester Malan Nature Reserve, Kameelboom, Kamfersboom, Keimoes Island, Kingston Farm, Kransbrak, Ky Ky, Louisvale, Marrick, Mata Mata Camp, Monro, Nossob Camp, Platbakkies, Port Nolloth, Rolfontein Nature Reserve, Rooidam, Samevloeiing, Springbok, Stolzenfels, Twee Rivieren Camp, Upington, Upington E, Witwater. Holocene: Abbots, Blinkklipkop, Klein Witkrans, Limerock, Powerhouse, Wonderwerk, Zoovoorbij. New records: Auchterlonie, Benfontein Game Reserve, De Cruis, Deekrand, DoornkloofNature Reserve, Doornkuilen, Driekoppen, Gelukspruit, Holpan, Kangnas Farm, Kaitob Berg, Kenhardt Railway Bridge, Kleinbegin Station, Kleinbegin-Kenhardt Road, Kransbrak, Laaikrale, Lokenburg Farm, Lovers Leap, Skilpad Wildflower Reserve, Spitzkop Nature Reserve, Swartpad, Twee Rivieren A, B and C, Weltevrede. Comments: large southern African gerbils were previously referred to the genus Tatera but the latter name is now restricted to India (Musser & Carleton 2005). Synonyms: Tatera miliaria Wroughton, 1906; Tatera lobengulae griquae Wroughton, 1906; Tatera brantsii namaquensis Shortridge & Carter, 1938. 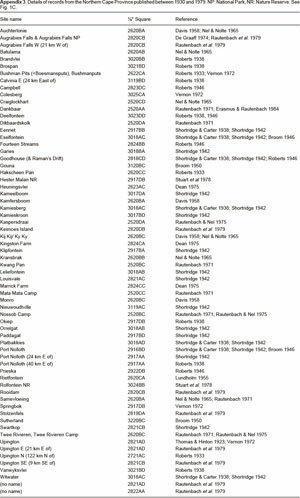 1930-1979: Auchterlonie, Dankbaar, Goodhouse, Kamfersboom, Ky Ky, Louisvale, Mata Mata Camp, Nossob Camp, Swartkop, Twee Rivieren Camp. 1980+: Heuningsvlei, Moffat Mission, Swartmodder. New records: Auchterlonie, Benfontein Game Reserve, Deekrand, Dronfield Game Reserve, Gelukspruit, Kenhardt Railway Bridge, Kleinbegin Station, Kleinbegin-Kenhardt road, Swartpad, Twee Rivieren A, B and C, Weltevrede. Synonym: Tatera miliaria stellae Wroughton, 1906. 1930-1979: Augrabies Falls W, Augrabies Falls National Park, Hester Malan Nature Reserve, Stolzenfels, Upington E.
1980+: Grootfontein, Kingston Farm, Marrick, Swartmodder, Vaalharts. New records: Holpan, Kransbrak, Spitzkop Nature Reserve. Synonyms: Gerbillus tenuis A. Smith, 1842; Gerbillus paeba broomi Thomas, 1918; Gerbillus calidus Thomas, 1918. Pre-1930: Latakoo N, Molopo R. W of Morokwen, Port Nolloth. 1930-1979: Auchterlonie, Augrabies Falls National Park, Batulama, Bushmanputs, Craiglockhart, Dankbaar, Eenriet, Goodhouse, Hester Malan Nature Reserve, Kameelboom, Kamfersboom. Kingston Farm, Kransbrak, Ky Ky, Marrick, Mata Mata Camp, Monro, Nieuwoudtville, Nossob Camp, Platbakkies, Port Nolloth, Rolfontein Nature Reserve, Rooidam, Samevloeiing, Stolzenfels, Twee Rivieren Camp, Upington, Upington E, Witwater. 1980+: Grootfontein, Heuningsvlei, Marrick, Moffat Mission, Namaqua National Park, Swartmodder. Holocene: Aspoort, Blinkklipkop, Dikbosch 1, Klein Witkrans, Powerhouse, Spoegrivier, Wonderwerk, Zoovoorbij. New records: Auchterlonie, De Cruis, Deekrand, Doornkloof Nature Reserve, Doornkuilen, Driekoppen, Gelukspruit, Holpan, Kangnas Farm, Kaitob Berg, Kransbrak, Kenhardt Railway Bridge, Klein Witpan, Kleinbegin Station, Laaikrale, Lovers Leap, Ongers River Bridge, Skilpad Wildflower Reserve, Spitzkop Nature Reserve, Swartpad, Twee Rivieren A, B and C, Vergelegen 132, Weltevrede. 1930-1979: Augrabies Falls National Park, Augrabies Falls W, Rolfontein Nature Reserve, Rooidam, Stolzenfels, Upington E.
Bridge, Kleinbegin Station, Kleinbegin-Kenhardt road, Laaikrale, Spitzkop Nature Reserve, Swartpad. Comments: the outliers to the south and east indicate a wider range than that shown in Skinner and Chimimba (2005). 1980+: Grootfontein, Swartmodder, Vleiplaas Farm. Holocene: Dikbosch 1, Equus, Limerock, Powerhouse, Spoegrivier. 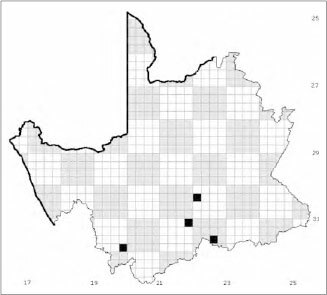 Comments: records of Aethomys from the Northern Cape Province were published as A. chrysophilus before A. ineptus was recognized as a separate species (Chimimba et al. 1999). A subsequent study (Linzey et al. 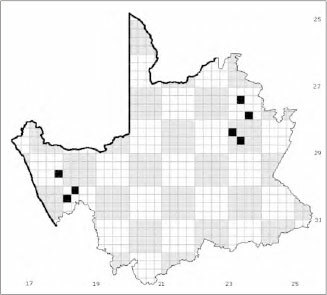 2003) to determine the distribution of the two species based on firmly identified specimens found only one specimen from either species, an A. ineptus, from the Northern Cape Province (Vleiplaas Farm near Kuruman). It appears, however, that the range of A. ineptus may extend further south than that of A. chrysophilus (Linzey et al. 2003) and that it is the exclusive occupant of the high elevation interior of South Africa (Chimimba & Linzey 2008). The eastern Holocene samples may represent a slightly extended range in the past. The material from Swartmodder and Spoegrivier represents evidence of a much wider distribution than that of today (Chimimba et al. 1999; Linzey et al. 2003). Comments: only one species of Dasymys is recognized in South Africa by Wilson & Reeder (2005) but it has recently been proposed that there are, in fact, three (Mullin et al. 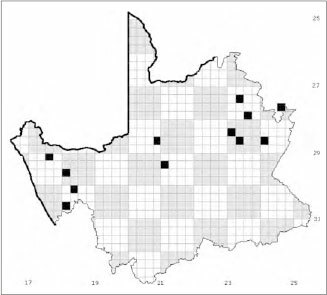 2005).Two disjunct populations in the Western Cape are referred to D. capensis, D. incomtus sensu stricto is restricted to KwaZulu-Natal, and D. robertsii is found in the extreme north of the country as well as marginally in Botswana. The material from Wonderwerk was referred to D. incomtus sensu lato and it remains to be seen to which species it should now be referred. Although this Pleistocene record is far from any current known localities, it is of some interest to note that Wonderwerk effectively lies on the proposed dispersion route from the earliest Dasymys at Makapansgat, north of Pretoria, to the southern populations now ascribed to D. capensis (Mullin et al. 2005). Moreover, the habitat of this genus is discontinuous, being marshes and other wet ground, (Skinner & Chimimba 2005) so variations in past climate will have played a critical role in its distribution, as Mullin et al. (2005) themselves acknowledged. Type locality: Kuruman (fixed by Roberts 1951). 1930-1979: Augrabies Falls National Park, Augrabies Falls W, Colesburg, Kingston Farm, Marrick, Rolfontein Nature Reserve, Rooidam, Upington. Holocene: Blinkklipkop, Dikbosch 1, Equus, Klein Witkrans, Limerock, Powerhouse. New records: Driekoppen, Doornkloof Nature Reserve, Doornkuilen, Gelukspruit, Kenhardt Railway Bridge, Kleinbegin Station, Laaikrale, Ongers River Bridge, Spitzkop Nature Reserve, Swartpad, Vergelegen 132. Comments: material listed here as M. coucha includes specimens published as M. natalensis at a time when the former was not recognized as a species. Subsequently, the two species have been separated on karyotypic grounds (Venturi et al. 2004) but, while three West African species of Mastomys have been differentiated on the basis of cranial and dental criteria (Granjon et al. 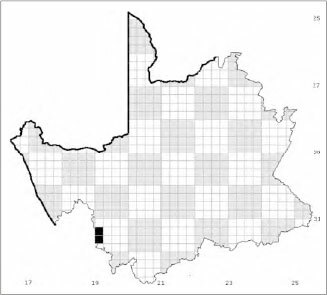 1997), this has not yet been done for the two southern African taxa. Therefore there is currently no reliable means of separating the two species on cranial remains because it is not certain that osteological criteria can be transferred from one geographical region to another. 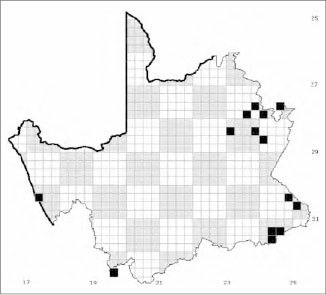 However, M. natalensis appears to be restricted to the lower altitude wetter eastern part ofSouth Africa (Venturi et al. 2004) and it is probable that all the Northern Cape records, which represent a westwards extension of the known range of the genus, would today be assigned to M. coucha. Synonyms: Mus auricomis centralis Schwann, 1906; Mus lehocla A. Smith, 1836.
pre-1930: Augrabies Falls, Deelfontein, Klipfontein, Kuruman, Louisvale. 1930-1979: Augrabies Falls National Park, Augrabies Falls W, Eenriet, Eselfontein, Goodhouse, Hester Malan Nature Reserve, Kameelboom, Kaspersdraai, Kingston Farm, Keimoes Island, Nossob Camp, Rolfontein Nature Reserve, Rooidam, Platbakkies, Stolzenfels, Swartkop, Upington E, Witwater. Holocene: Abbots, Blinkklipkop, Wonderwerk, Zoovoorbij. New records: De Cruis, Deekrand, Doornkloof Nature Reserve, Doornkuilen, Driekoppen, Gelukspruit, Holpan, Kaitob Berg, Kenhardt Railway Bridge, Kleinbegin Station, Kransbrak, Lokenburg Farm, Lovers Leap, Skilpad Wildflower Reserve, Swartpad, Vanzylsrus, Vergelegen 132. Type locality: M. indutus Molopo R, W of Morokwen. 1930-1979: Auchterlonie, Batulama, Bushmanputs, Colesburg, Craiglockhart, Dankbaar, Eselfontein, Goodhouse, Hester Malan Nature Reserve, Kamfersboom, Kingston Farm, Kransbrak, Ky Ky, Monro, Nossob Camp, Rolfontein Nature Reserve, Samevloeiing, Springbok, Twee Rivieren Camp. 1980+: Grootfontein, Heuningsvlei, Marrick, Moffat Mission, Namaqua National Park, Swartmodder, Vaalharts. Holocene: Blinkklipkop, Dikbosch 1, Powerhouse, Spoegrivier, Wonderwerk. New records: Auchterlonie, Benfontein Game Reserve, De Cruis, Deekrand, DoornkloofNature Reserve, Doornkuilen, Driekoppen, Dronfield Game Reserve, Gelukspruit, Holpan, Kaitob Berg, Kenhardt Railway Bridge, Kleinbegin Station, Kleinbegin-Kenhardt road, Klein Witpan, Kransbrak, Laaikrale, Lokenburg Farm, Lovers Leap, Skilpad Wildflower Reserve, Spitzkop Nature Reserve, Swartpad, Twee Rivieren A, B and C, Vergelegen 132, Weltevrede. 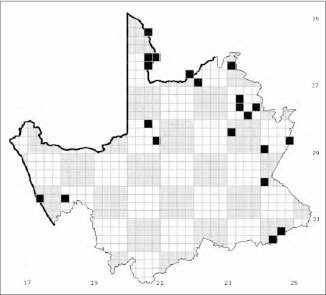 Comments: M. indutus in the Northern Cape Province is thought to be restricted to the extreme northern part whereas M. minutoides occurs in the southern half of the province (Skinner & Chimimba 2005). 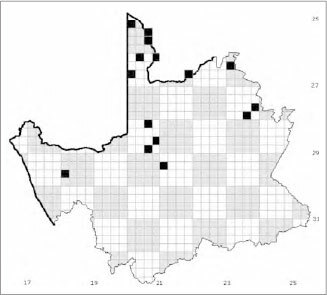 Although the generalized distribution maps of the two species are largely complementary, there is an area in the northeastern part of the province where neither is shown (Skinner & Chimimba 2005). The present records indicate, however, that either or both species do occur in part, at least, of this area. It should also be noted that, in recording Leggada m. minutoides from Goodhouse on the Orange River, Shortridge (1942) commented that this was a new record for Little Namaqualand. 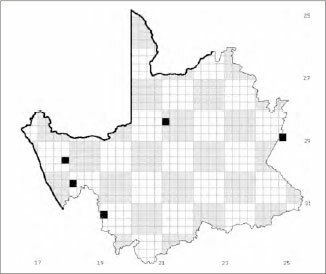 Moreover, it is not impossible that some of the material from along the Northern Cape-Free State border should assigned to M. orangiae, which, although currently known only from the Free State, is considered a good species pending resolution of relationships within the genus (Musser & Carleton 2005). If so, this would constitute a westwards extension of M. orangiae. 1930-1979: Eselfontein, Hester Malan Nature Reserve, Louisvale, Nieuwoudtville, Witwater. New records: Benfontein Game Reserve. Comments: M. verreauxii is almost entirely restricted to the Western Cape Province (Skinner & Chimimba 2005) and no more than this marginal encroachment into the Northern Cape Province is expected. Synonym: R. dilectus: R. pumilio griqoides Roberts, 1946. R. pumilio: Arvicanthis pumilio cinereus Thomas & Schwann, 1904; A. p. griquae Wroughton, 1905; A. p. intermedius Wroughton, 1905; R. p. orangiae Roberts, 1946; R. p. prieskae Roberts, 1946.
pre-1930: Deelfontein, Garies, Klipfontein, Kuruman, Louisvale, Port Nolloth. 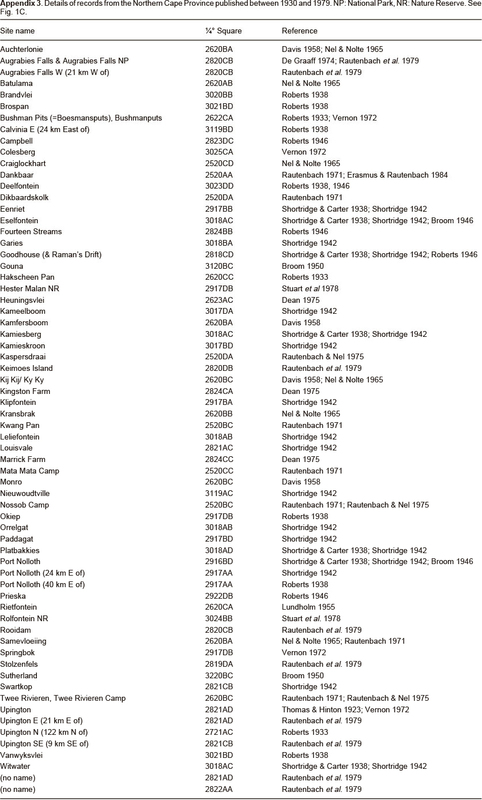 1930-1979: Auchterlonie, Augrabies Falls National Park, Augrabies Falls W, Batulama, Campbell, Colesburg, Craiglockhart, Dankbaar, Eenriet, Eselfontein, Fourteen Streams, Goodhouse, Hester Malan Nature Reserve, Kameelboom, Kingston Farm, Kransbrak, Ky Ky, Mata Mata Camp, Monro, Nieuwoudtville, Nossob Camp, Prieska, Rooidam, Rolfontein Nature Reserve, Samevloeiing, Springbok, Stolzenfels, Twee Rivieren Camp, Witwater. Holocene: Blinkklipkop, Dikbosch 1, Equus, Klein Witkrans Limerock, Powerhouse, Spoegrivier, Wonderwerk, Zoovoorbij. New records: Auchterlonie, Benfontein Game Reserve, De Cruis, Deekrand, DoornkloofNature Reserve, Doornkuilen, Driekoppen, Gelukspruit, Holpan, Kaitob Berg, Kenhardt Railway Bridge, Kleinbegin Station, Kleinbegin-Kenhardt Road, Kransbrak, Laaikrale, Lokenburg Farm, Lovers Leap, Ongers River Bridge, Skilpad Wildflower Reserve, Twee Rivierenn C, Vergelegen 132. 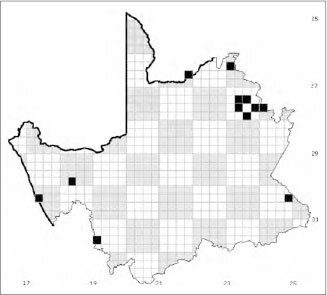 Comments: R. dilectus is a mesic form recognized by Musser and Carleton (2005) but not Skinner and Chimimba (2005) and only recorded in South Africa from the eastern part of the country (Musser & Carleton 2005, quoting Rambau et al. 2003). 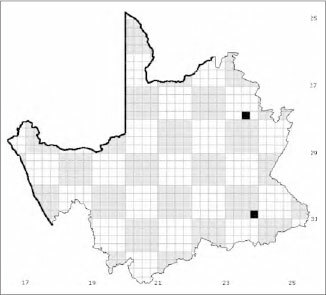 However, R. p. griqoides has been referred to R. dilectus (Musser & Carleton 2005) and Fourteen Streams is the type site of this taxon, which would suggest a more westerly occurrence of the species than that, and a marginal incursion into the Northern Cape Province. More analysis would seem to be warranted to determine the truth of the situation. Synonym: Thallomys nigricauda davisi Lundholm, 1955. 1930-1979: Batulama, Dankbaar, Kaspersdraai, Kwang Pan, Nossob Camp, Rietfontein. 1980+: Goegab, Grootfontein, Heuningsvlei, Swartmodder. New records: Kenhardt Railway Bridge, Kransbrak, Lovers Leap, Swartpad. Comments: at times T. nigricauda was not recognized as distinct from T. paedulcus so some of the material now included above was published under the latter name. 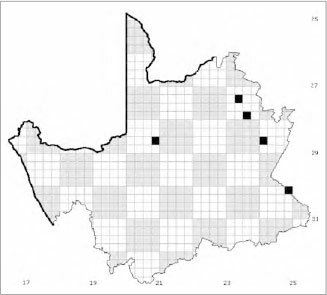 More recently, however, T. nigricauda is considered the Northern Cape form (Taylor et al. 2008). whereas T. paedulcus only reaches as far south as northern South Africa (Taylor & Boitani 2008); Thallomys paedulcus, on the other hand, is probably restricted to the more mesic zones to the north and east (Musser & Carleton 2005; Taylor et al. 2008) although Taylor et al. (1995) have suggested that the distribution of the two species may not be as clear-cut as it would appear (see also Musser & Carleton 2005 and Skinner & Chimimba 2005). Material from Nossob and Twee Rivieren Camp, identified by Rautenbach & Nel (1975) as T. shortridgei, should almost certainly be assigned to T. nigricauda according to current usage. The new record from Kenhardt appears to represent an extension of the existing records. 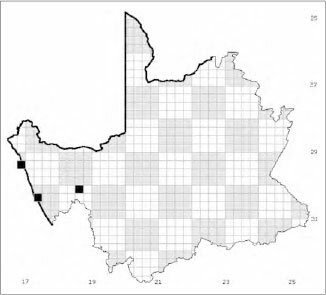 Comments: this species, which is accepted by Musser & Carleton (2005) but whose status is considered not fully resolved by Boitani & Taylor (2008), is said to be restricted to the south bank of the Orange River between about Upington and Goodhouse. It therefore seems likely that the post-1970 specimens from the Kgalagadi Transfrontier Park should now be referred to T. nigricauda. pre-1930: Nossob Camp, Twee Rivieren Camp. New records: Kransbrak, Twee Rivierenn C.
Comments: the material from Zoovoorbij indicates that this species previously had a wider range than appears to be the current case. Comments: the record from the Hester Malan Nature Reserve (Stuart et al. 1978) constitutes an outlier from the main area of distribution for this species, which is much further east (Skinner & Chimimba 2005). Synonyms: Otomys unisulcatus broomi Thomas, 1902; Otomys unisulcatus granti Thomas, 1902. 1930-1979: Eenriet, Eselfontein, Kameelboom, Witwater. New records: De Cruis, Doornkuilen, Driekoppen, Holpan, Ongers River Bridge, Skilpad Wildflower Reserve, Vergelegen 132. Comments: a probable M. unisulcatus was also recorded from the Herbert District (Skead 2011). 1980+: Grootfontein, Marrick Farm, Moffat Mission, Vaalharts. Holocene: Blinkklipkop, Dikbosch 1, Klein Witkrans, Wonderwerk. Synonym: Otomys irroratus coenosus Thomas, 1918. Holocene: Blinkklipkop, Dikbosch 1, Klein Witkrans, Spoegrivier, Wonderwerk. New records: Benfontein Nature Reserve, Driekoppen, Doornkloof Nature Reserve, Vergelegen 132. 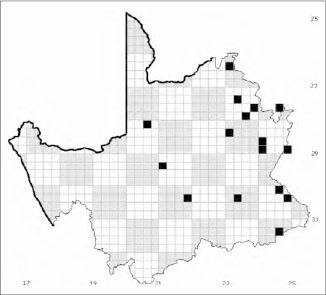 Comments: the archaeological samples suggest that O. irroratus previously ranged further west than is currently the case (Skinner & Chimimba2005), possiblyattimes ofhigher rainfall. 1930-1979: Hester Malan Nature Reserve. New records: Doornkloof Nature Reserve, Driekoppen, Skilpad Wildflower Reserve, Vergelegen 132. Comments: the material from Spoegrivier was published at a time when O. karoensis was subsumed within O. saundersiae. Recently, however, Taylor et al. 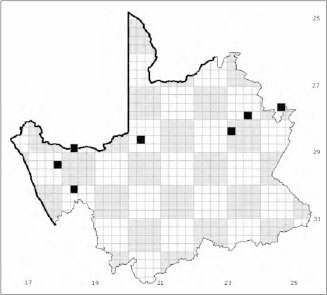 (2009) have shown conclusively that the latter is not a good species while O. karoensis may be regarded as such in the western part of South Africa. In view of the fact that all these records, if correct, represent range extensions for O. karoensis and because there is considerable morphometric variation in O. irroratus (Taylor etal. 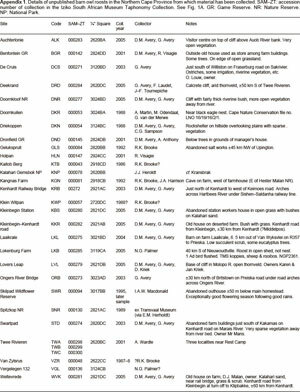 2009), these identifications require confirmation. Synonyms: P. b. deserti Roberts, 1933; P. b. luteolus Thomas & Schwann, 1904; Euryotomys pallida Wagner, 1841. Type locality: 'towards the mouth of the Orange R'. pre-1930: Anenous, Klipfontein, Port Nolloth. 1930-1979: Auchterlonie, Augrabies Falls National Park, Batulama, Bushmanputs, Craiglockhart, Dankbaar, Eenriet, Hester Malan Nature Reserve, HSP, Kameelboom, Kransbrak, Ky Ky, Mata Mata Camp, Platbakkies, Port Nolloth, Rolfontein Nature Reserve, Samevloeiing, Twee Rivieren Camp, 2821AD, 2822AA. New records: Auchterlonie, Kaitob Berg, Twee Rivieren C.
Comments: Thunberg's 1811 painting of Arctomys vigil was identified as Parotomys brantsii by Rookmaker (1989, p. 305). Synonym: P. l. molopensis Roberts, 1933. 1930-1979: Eenriet, Goodhouse, Hakscheen Pan, Louisvale, Port Nolloth. New records: Kangnas Farm, Kenhardt Railway Bridge, Swartpad. Synonym: B. j. inselbergensis Shortridge & Carter, 1938. 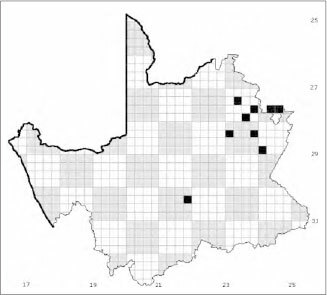 Comments: the mole-rats recorded from near the mouth of the Orange River (Alexander 1838) and at Robbe Bay, Port Nolloth (Backhouse 1844) may have been B. janetta. pre-1930: Molopo R west of Morokwen. 1930-1979: Ky Ky, Mata Mata Camp, Twee Rivieren Camp. Comments: Rautenbach (1971, citing De Graaff, pers. comm.) 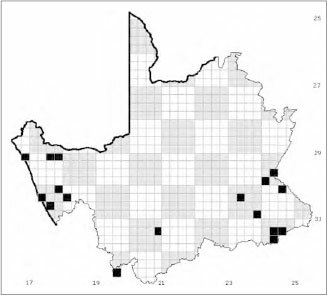 recorded C. hottentotus damarensis from the Kalahari Gemsbok National Park so it is probable that other records published as C. hottentotus (e.g. Nel et al. 1984) followed the same source and included damarensis in C. hottentotus. 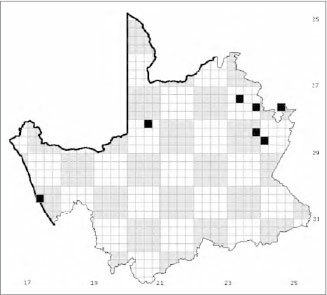 Certainly today it is accepted that only C. damarensis occurs in the Kgalagadi TP (Skinner & Chimimba 2005). 1930-1979: Eenriet, Eselfontein, Nieuwoudtville, Rolfontein Nature Reserve, Witwater. 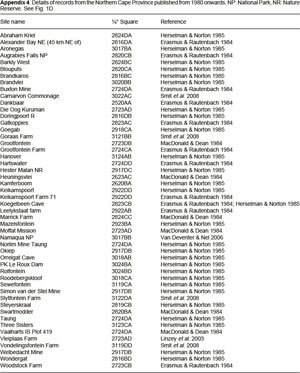 Holocene: Abbots, Aspoort, Blinkklipkop, Dikbosch 1, Equus, Klein Witkrans, Limerock, Powerhouse, Spoegrivier, Wonderwerk, Zoovoorbij. New records: Doornkloof Nature Reserve, Driekoppen, Dronfield Game Reserve, Holpan, Kleinbegin Station, Lokenburg Farm, Ongers River Bridge, Vergelegen 132. 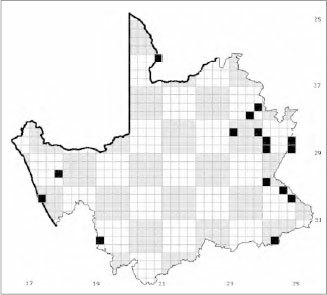 Comments: Rookmaker (1989, p. 304) proposed that the 'blesmollen' collected by Gordon in 1779 from Ellenboogfontein and Kamiesberg may have been either Bathyergus janetta or Cryptomys hottentotus grounds that these localities are far outside the known range ofthis taxon. However, since Nieuwoudtville is not, in fact, a great further south and Kamiesberg is very close to Ellenboogfontein, there seems no reason to reject the latter record. Type locality: 'mountains towards mouth of Orange River'. 1939-1979: Augrabies Falls National Park, Eenriet, Goodhouse, Kameelboom, Platbakkies, Witwater. New records: Swartpad. Iziko South African Museum provided facilities and curates many of the collections of modern owl pellets. The studywould nothave beenpossible withoutthe helpofmany collectors, in particular the late R.K. Brooke. A. Monadjem, University of Swaziland, made important comments on current taxonomy; any remaining mistakes are not his.